La Mansion Hostel is a colonial house located Downtown on the main square of San Gil, the hostel has 11 rooms all ensuite with dorms and privates, the hostel will give you the best feeling of a traditional Colombian house, Free Wi Fi, guest kitchen where you can cook your own food,, pool table, table tennis, TV with directv, restaurant with traditional or tipycal colombian lunch, the best steak, hamburgers, pork ribs, mojitos and margaritas in town, best location, dormitories with lockers thee best atmosphere, some rooms with its own balcony and if you are looking for a modern place we have our main hostel SamS VIP just one block from us. La Mansion is a great base from which to explore this vibrant city. From here, guests can enjoy easy access to all that the lively city has to offer. With its convenient location, the hotel offers easy access to the city's must-see destinations. All guest accommodations feature thoughtful amenities to ensure an unparalleled sense of comfort. The hotel offers an excellent variety of recreational facilities, including table tennis, pool table, kitchen, garden. Superb facilities and an excellent location make the La Mansion the perfect base from which to enjoy your stay in San Gil. Check in time starts at 09:00 to 22:00 . Check out time 11:00 . This is one of the nicest hostels I've stayed in. Eduardiño took care of us during our stay - a very attentive, friendly and helpful chap! This made a difference for us. The hostel has pleanty of historic character, a lovely clean kitchen with good equip and is pretty laid back. Perfectly located on main square. Great coffee from the restaurant and decent free coffee for hostel customers in the mornings. The private room was very simple and has a working can. 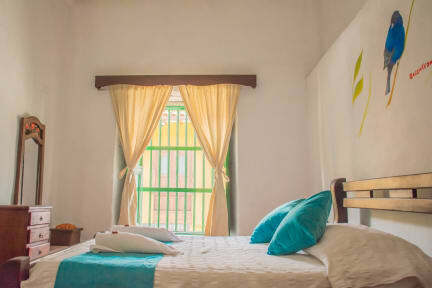 The hostel is very beautiful and located right in the middle of town, you get a view on the town's central park. 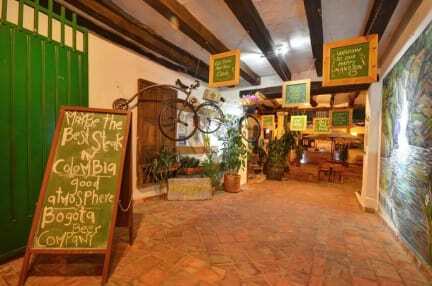 The staff is very friendly and yhe restaurant located in the hostel is cheap and very tasty! There is a ping pong and a pool table plus a computer for the guests. The dorms are spacious and comfortable and the hostel is very clean. Great location, the staff is super helpful and nice. As a solo traveler, not much socializing scene in the hostel. But you get to see most in all the activities offered. So was just fine. For the ladies there's a great hair salon and pedi - medi across the street. Great hostel for families or couples who would like a private room with ensuite bathroom. The atmosphere is lacking a bit (not many places to just sit around and chill). However the restaurant downstairs is a HUGE plus and a great value for the money (we ate there almost every day). The staff is by far the most helpful of any hostel we've stayed in, and it was super easy to book a tour through them. Would recommend! We were kindly upgraded to a larger room at this hostel (for no reason!) which was nice. However, it was the noisiest room we have EVER stayed in. The staff were very friendly and helpful. The burger in the restaurant below was nice but do also check out ‘Gringo Mike’s’ which is a few doors up the street. San Gil is a nice town. Just about any person from the street could walk in during the day. The location is great, by the main square where everything is. Staff were nice, tried to help but often didn't know how or couldn't speak English well enough. The atmosphere was lacking. Except for in-dorm interactions there were no hostel activities or anything. Cleaniness was bad, ants in the kitchen, pretty sure we had bed bugs. They offer most activities, BUT would cost more than through another property down the street. Staff wasn't super friendly and didn't offer much info besides checking us in. Security is not strictly monitored. Shared dorm was fine for the price. There is a social area and a computer for guests' use which is nice. Good location.